It was May 2008 that a few local musicians started gathering on a corner near the Washington Waterfront to share some musical talent. Over the past 10 years, this weekly gathering has grown into a unique Beaufort County attraction for both musicians and music lovers all over Eastern Carolina. In partnership with Arts of the Pamlico, BCTMA is based at the historic Turnage Theater at 150 West Main Street, Washington, NC. This venue provides a stage for guest musicians and monthly Variety Shows. 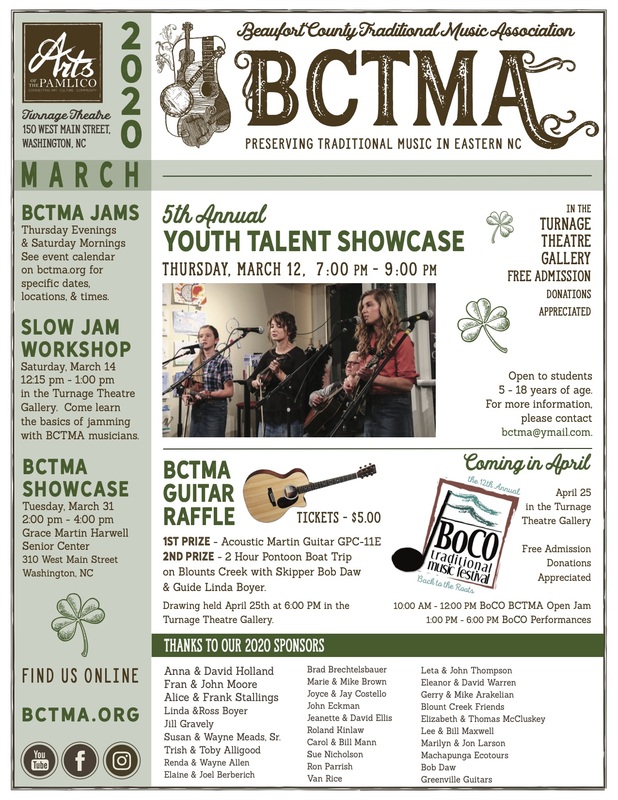 BCTMA also hosts Thursday Evening and Saturday Morning Jams where musicians of all skill levels are invited to come out for these informal events. Bring an instrument, or just come to listen. For more information about BCTMA, explore the website or get in touch. BCTMA has over 1500 photos online spanning our first ten years. Visit our photos page to have a look, or head over to our Flickr photostream. Our weekly jams on Thursday nights and Saturday mornings are open to musicians of all levels. Check our events calendar for specific dates and times. Since 2011, BCTMA has posted over 100 videos of our events, receiving over 32,000 views. Drop by our videos page and our YouTube channel to watch a few. Become a BCTMA Member or Sponsor. Susan and Wayne Meads Sr.